CoisCéim Dance Theatre at RHA Gallery, BODY LANGUAGE by David Bolger. Photo by Christopher Ash. CoisCéim Dance Theatre at RHA Gallery, BODY LANGUAGE by David Bolger. Photo by Christopher Ash. Under the shifting hegemony of now this, now that science or art, the Game of games had developed into a kind of universal language through which the players could express values and set these in relation to one another. Throughout its history the Game was closely allied with music, and usually proceeded according to musical and mathematical rules. One theme, two themes, or three themes were stated, elaborated, varied, and underwent a development quite similar to that of the theme in a Bach fugue or a concerto movement. A Game, for example, might start from a given astronomical configuration, or from the actual theme of a Bach fugue, or from a sentence out of Leibniz or the Upanishads, and from this theme, depending on the intentions and talents of the player, it could either further explore and elaborate the initial motif or else enrich its expressiveness by allusions to kindred concepts. Beginners learned how to establish parallels, by means of the Game’s symbols, between a piece of classical music and the formula for some law of nature. Experts and Masters of the Game freely wove the initial theme into unlimited combinations. The performance relieves the person temporarily of the burden of being themselves. Each wall of the large gallery space in the RHA is covered in a photographic grid, a series of portraits of one person (or occasionally 2 or 3 people) in different poses, including close-ups and long shots. 176 mirrors of the interviewee – a different person each day – who is first asked to ‘act’ happy, depressed, joyous, giving rise to rather stylized gestures. All images are in motion at this stage, repeated on the walls, and the interviewer-photographer chooses when to close the shutter, freezing each image in turn. The interviewer, Christopher Ash, gradually becomes quieter, we can no longer hear his questions, and things take a more serious turn, the photographs too begin to deepen, the end of the interview saved for the most personal story, of which we hear nothing but sense its importance to the interviewee, close-ups on a deep wall of the gallery. The tools appear to be a kind of Stanislavski or Meisner method used on the interviewee. The focus of the work – a person’s body language. The 6 dancers from CoisCéim Dance Theatre first mimic the audience’s poses then respond to the images, standing in various places on the makeshift grid – two walls of 8 x 4, one 16 x 4, one 12 x 4 of images of the interviewee – before moving around its coordinates, selecting images to which they will respond, improvising. And then the contemporary dance piece begins. I saw the piece four times. It shifts in the mind: A strange gameshow with social media stars; a high-tech new media gym; a 24 hour news channel broadcast with the sound turned down; a dream where all the characters are you, the interviewee; Strictly meets poststructuralist linguistics. Body language is usually an unconscious language – your body speaks all the time though you have no desire for it to speak. Mirroring can be love, attraction; it is how a child learns; it can be making fun of someone. All of these and more become apparent in the performed dance. At times it reminds me of Pasolini’s Theorem (itself an allegory of fascism), when all the dancers appear to be in love with the interviewee’s image, luxuriating in being wrapped in their projections, internalizing their oversized body parts, large eyes, face. Strange though that this is a translation from words to body, when we usually think of body language as preverbal, preceding language. Seeing the piece for a second time, the work seems more like a method of learning for the dancers, as if they are space aliens acquiring language, all the more so when I recognize some gestures from the previous visit that are not on the grid – a dancer puts his hands over his face – as if they are building a language from scratch during this time, and they naturally have a memory of previous days. This becomes then an anthropological study of humans, and with the grid, calls to mind the structuralist anthropology of Claude Lévi-Strauss. A dancer places the tip of his forefinger against the tip of his thumb, creating a circle of flesh, copying one of the interviewee’s images. This is then taken up as a gesture and repeated like a motif by all the dancers, an ‘o’ made by thumb and forefinger, an ‘o’, like learning a letter of the alphabet, or a mathematical zero counterpoint to the multiplicity of stories, or a microcosm of the cyclical structure of the work. The all- white clothing of the dancers, suitable for projections too, does indeed make them look somewhat otherwordly or cult-like at times. The religious or schmaltzy (depending on your take) end to the dance each day is a purple L.E.D. tinged mise-en-abîme, as the dancers are infinitely repeated and seem to ascend to a door of light; of course, they are ascending to their spacecraft. The dance itself has at times the quality of a rehearsal, a repetition, at other times it becomes more polished. 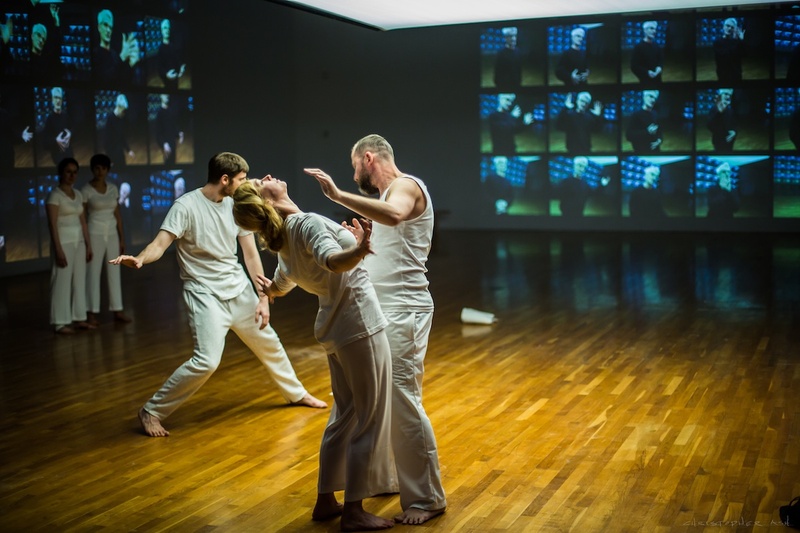 What we see though is the largely unconscious choreography of body language, used to create something in real time, rather than the typically prechoreographed dance piece. 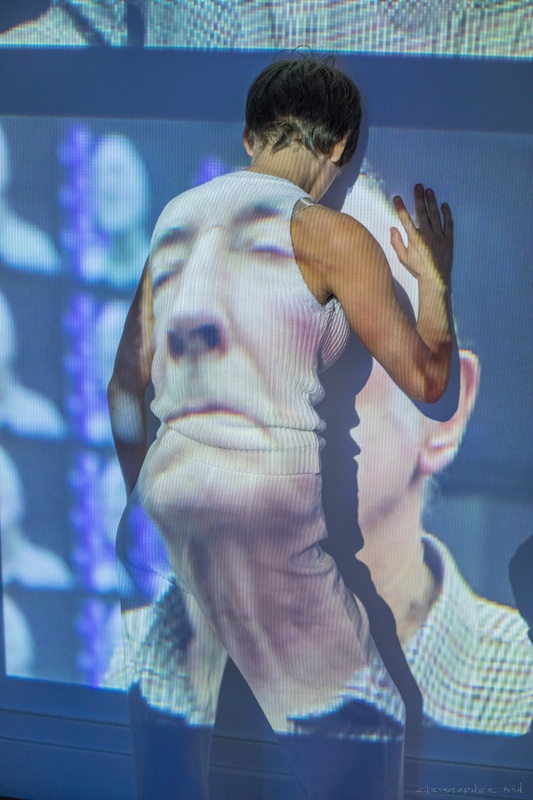 There were some particularly beautiful gestures that I happened to see, and two of the dancers in particular, Jack Webb and Ivonne Kalter, were fluid and creative in their movements. One moving gesture from yesterday’s film occurred when the dancer (Jack Webb) selected the gesture of the interviewee eating something from her hand, and places one hand on his stomach, while his other hand mimics his own windpipe, up and down as he gulps for air, rather than gulping down food, as if it has become the action of survival itself. This is seen both in the real and mediated images. And this action too relates back to Darwin’s conception of the origins of body language, as a means of survival. This is an open artwork, a Barthesian writable text. The possible number of permutations of gestures and dance moves for one dancer given 176 images is literally nearly a billion. So many stories, so many works are contained in potential here. A philosophical idea of all possible stories, emanating from a single story – and one that we are never really told – deconstructed. One wall grid turns into a live video feed at the end of the interview as the dance begins and thousands of possible permutations of stories come crashing down. A logistical issue: The grid they set themselves, the fundamental structure, they undo through the live feed, although this feed and resultant video often prove more compelling than watching the dancers live, a consequence of scale and visibility. The dance exhibition is currently in vogue. Exhibitions like Anne Teresa De Keersmaeker’s Work/Travail/Arbeid at the Tate Modern in 2016 and MoMA in 2017 which takes inspiration from geometrically precise overlapping chalk circles drawn on the ground, also takes the form of nine hour cycles. Or body and performance in Anne Imhof’s Faust or the situations of Tino Seghal. Why is it dance that is popular in the visual arts we might ask, rather than, or perhaps as well as, any other discipline such as say literature? The body and gesture are a shared language between the two disciplines, and then it is the centrality of the body in contemporary culture and biopolitics that seems to place dance centre stage. 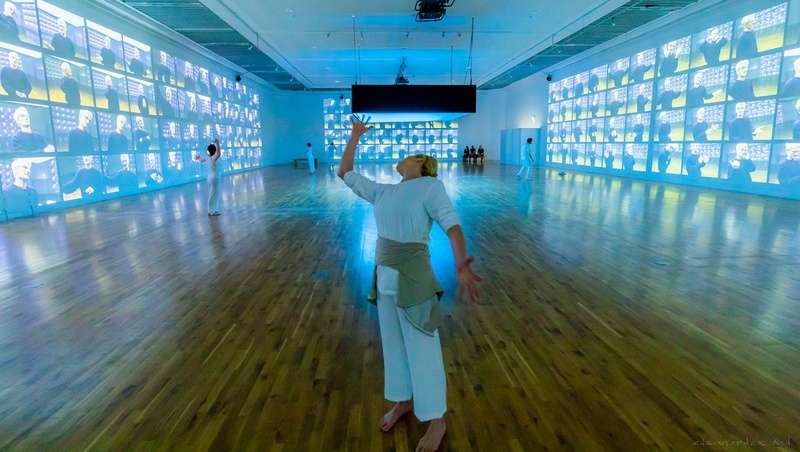 Performing contemporary dance in a gallery (rather than a theatre) has been fashionable for decades, since the beginning of attempts to effect the dematerialisation of the art object, but interdisciplinary work installed in the gallery is rarer, certainly in Ireland, and it is good to see a work that does encompass different disciplines being hosted by the RHA. Perhaps more attention could have been paid to the visual art context however, which could have included collaborating with other visual artists, since it appears as though certain decisions were made more according to how a dance theatre group would approach the material rather than how a visual artist would conceptualise a work. In the visual arts the distinction between dancer and audience or interviewee might be blurred more significantly, or even reversed (such as in recent works by Jérôme Bel in Artist’s Choice: Jérôme Bel/MoMA Dance Company in 2016 where it is the gallery staff who perform the dance) while here they have been kept somewhat separate and the desire to still put on a good show seems to dominate. Some of the decisions, such as to make everything live, to use only one camera, or to freeze the images rather than keeping them as short gifs or video loops, result in some good gestures inevitably being lost, but this liveness does nevertheless lend the work a freshness and spontaneity each day. When viewing this show, Muybridge’s photographic studies in motion come to mind, as does the fame promised by social media through self-objectification, and even Le Corbusier’s machine-for-living dystopian tower blocks as well as the totalizing surveillance systems of contemporary life. Dance, the seminal work of 1979 by Lucinda Childs, Sol le Witt and Philip Glass, is a clear progenitor too with its projected, expanding floor grid, and its filmed dancers appearing many times larger than the live dancers, just as they do here. Rosalind Krauss, in her essay ‘Grids’ of the same year locates the origin of the grid in modernism and she describes modern art as hostile to literature, narrative and discourse, although she does also attest to the spiritual qualities of the form. Flattened, geometricized, ordered, it is antinatural, antimimetic, antireal. It is what art looks like when it turns its back on nature. The photo grid tends towards either the institutional or the totalitarian and frequently relates to captivity. Another grid in another exhibition – contemporaneous to this one – the Tate Modern exhibition Red Star over Russia 1905-55 but this grid of photo portraits is of political prisoners, those shipped off to gulags mostly never to return. I was uncertain how much this darker side to the chosen aesthetic was intentional or accidental. The result is a somewhat retro quality to the work, which could have been surmounted by greater use of new technologies or algorithms, or perhaps through exploiting the grid/game system further, incorporating musical decisions too into this. The composer, Michael Fleming’s music was melancholy and evocative, and the La La La choir added interest during weekend performances, but the music could have responded to the interviewee’s gestures too in a more rigorous way, instead of remaining static, and the choir also could have been placed within this system. In the spirit of John Cage’s experiments with the I Ching, or even in the above quoted imaginary Glass Bead Game in Hermann Hesse’s novel where the game is played in some remote future school in the 25th century, a more rigorous following of the system might enable some even more interesting results. More diversity of interviewees would also create more diversity of body languages, plural. And although there were some attempts at diversity of gender, age and sexuality, there was a tendency for the aesthetic to look rather white and normative, and for the show in general to be a bit too ‘family friendly’ (!) thereby narrowing down and blunting the edge of a work that is potentially hugely diverse in form. Given that the interviewees were preselected rather than being chosen from within that day’s audience (and with no disrespect intended to those interviewed) perhaps a broader range of interviewees from different communities could have been chosen. However this is still an ambitious, thought provoking and at times very moving work created by David Bolger of CoisCéim and photographer and set designer Christopher Ash. 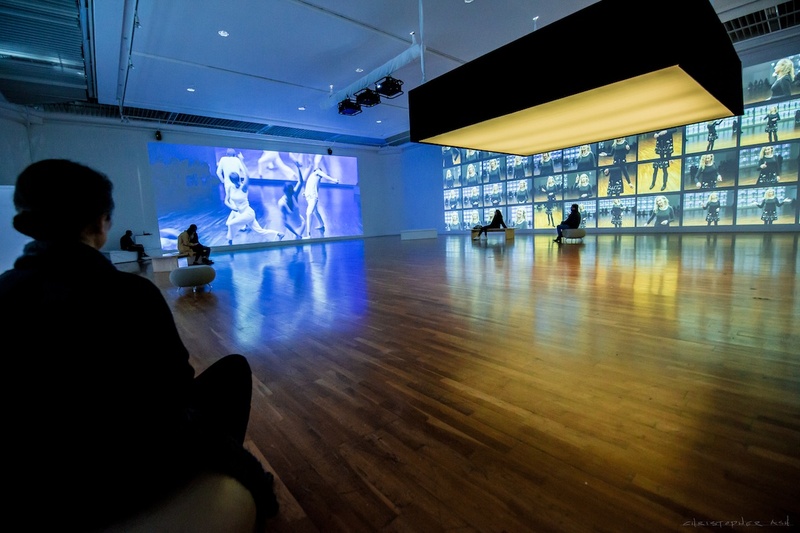 The installation, in its cyclical form, with its specified times to watch the interview, the live dance or the residual video content, is one that allows the viewer to spend time immersed within it, and to return with the expectation of a different experience on each occasion.